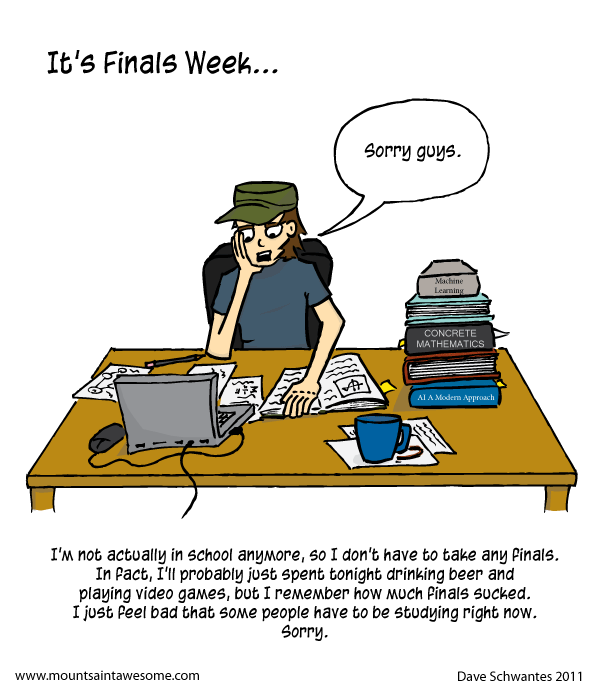 I apologize to all my studious readers if this comic was a little cruel. After finishing my masters last Spring, this is the one of the first "finals weeks" in a long time where I haven't had to study and it feels pretty good. I also spent a bunch of time today in the library at Berkeley doing my own work while Eileen and her classmates studied for their finals. I was glad that I didn't have to take an exam tomorrow morning. I do, in fact, have some of those books on my desk (hell, I even open them sometimes! ), spend time drawing graphical models, and drink coffee while staring blankly at my computer screen, so this comic is a pretty accurate representation of what I've been doing. Also, this week I picked up a copy of Manga Studio and started to play around with it. I don't think I'm ready to go all digital yet, but I did draw a crappy comic about the cat wearing a jet pack!